Register NOW for early bird prices! 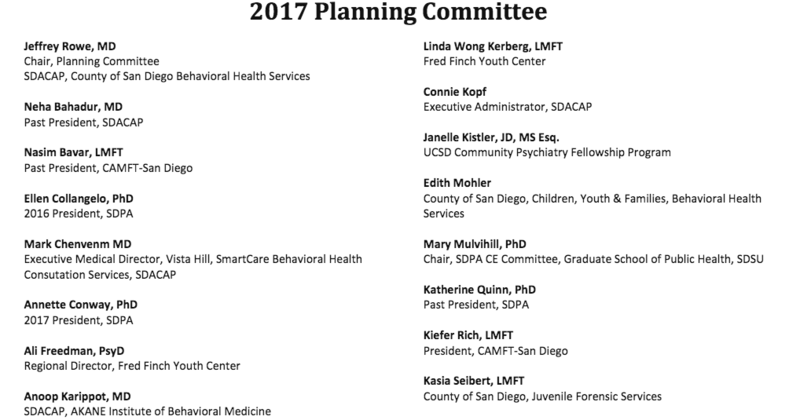 The 2nd Annual Critical Issues in Child and Adolescent Mental Health (CICAMH) Conference will be held on Saturday March 11, 2017 at the Crowne Plaza Hotel in San Diego, CA and will address Plasticity and Possibility in Youth, Families and Community. This one-day conference will feature nationally and locally known clinicians, best-selling authors, social action advocates and a panel of youth presenting on cutting-edge topics. Speakers will explore the challenges facing youth today, examine insights into the new world of teen communication and implications for child safety, and discuss key factors impacting risk for suicide in youth; substance abuse and families. Also featured will be school and community programs that are “Getting it Done” in the areas of violence prevention, restorative thinking, leadership and development and healing trauma. If you work with children, adolescents and families, this conference will provide you with new information about sexting, texting and the impact of social media on youth. You will hear about and key factors impacting youths’ risk for suicide, how we sometimes get it wrong – and the deadly tragedies that can occur when we do. And, you will explore what successful programs are doing to support youth resilience and facilitate positive outcomes. AMA: The University of California, San Diego School of Medicine designates this live activity for a maximum of 6.0 AMA PRA Category 1 Credits™. Physicians should claim only the credit commensurate with the extent of their participation in the activity. AAPA: AAPA accepts certificates of participation for educational activities certified for AMA PRA Category 1 Credit™ from organizations accredited by ACCME or a recognized state medical society. Physician assistants may receive a maximum of 6.0 hours of Category 1 credit for completing this program. Nurses: For the purpose of recertification, the American Nurses Credentialing Center accepts AMA PRA Category 1 Credits™ issued by organizations accredited by the ACCME. For the purpose of relicensure, the California Board of Registered Nursing accepts AMA PRA Category 1 Credits™ (report up to 6.0 hours of credit and list “CME Category 1” as the provider number). MFTs, LPCCS, LEPs, and LCSWs: This course is provided by the San Diego Chapter of the California Association of Marriage and Family Therapists, PCE #58. This course meets the qualifications for up to 6 hours of Continuing Education credit for MFTs, LCSWs, LPCCs and LEPs as required by the California Board of Behavioral Sciences. Alcohol and Addiction Counselors: This course is provided by the San Diego Chapter of the California Association of Marriage and Family Therapists. Provider approved by CCAPP-EI, provider number 15-16- 249-0618, for up to 5 CEH’s.